If you’re going to attach an antenna to your small house, getting a small outdoor HDTV antenna is a must. And using an antenna is also a recommended expense slasher and freedom enhancer. Opting for free TV by using an antenna over a paid service like cable or satellite fits the frugal and tiny lifestyles in several ways. It aligns with the goals of keeping expenses at the lowest possible level, breaking any chains that restrict freedom, and choosing the nonconforming path over the crowded common one. When choosing an antenna, you want one that compliments the design of your small house. This can be achieved by choosing one that is proportional to the size of your house and matches its theme. If you install a bulky standard size antenna on your small house it’s going to look ridiculous! It would be like installing a sports stadium, 80 unit, 50,000 watt, floodlight cluster to illuminate your front porch. Obviously an exaggeration, but I’m sure you get my point. Let’s look at how the option to use HDTV antennas came about and which one is the best choice. After all the publicity by the media and retailers about getting a converter box back in 2009 when the television industry made the switch from analog to digit broadcasts, I didn’t even know you could use an antenna. At least I didn’t until I got my first HDTV in the summer of 2011. Looking back I find it strange that there wasn’t much media attention about the fact that you could receive these signals for free if you had an HDTV and an outdoor or indoor antenna. Being frugal and always on the lookout for bargains, I’m certain I would have picked up on this information if it were in the public domain. I’m sure the cable and satellite companies wanted to keep this fact quiet since the switch would mean they would get new business from the people who had their analog TV connected to an antenna. When the switch happened I would imagine that it was in the media’s best interest politically to avoid talking about how you can easily get free TV service. Initially, I connected my new HDTV to my cable TV service, which was mandatory since I had been using an analog television. Somewhere along the way, I discovered that I could receive the digital broadcasts for free if I simply connected my HDTV to an antenna. I was sold immediately! A digital broadcast over the air actually provides you with a higher quality picture and sound because you’re getting it direct and not second like you do through cable and satellite services. You’ll immediately notice a difference. Since I had basic service with the cable company, I’m actually getting a couple more stations than I did before except a few of them are different. (My count only includes English and non-religious, non-commercial channels.) The new ones feature classic movies and television shows which I enjoy. There are also the standard network and PBS stations. Since I don’t watch the news or a lot of TV in general, this lineup works well for me. The number of stations you get will vary based on how far away or how close you are to the broadcast towers. Being too close can reduce the number of channels you get just as being too far away can. I know that doesn’t any make sense. I felt the same way. Let me explain. If you live at the base of a mountain that has a cluster of broadcasting towers on it, like I do, the signal will be too strong for the more powerful stations. I’m not getting two network stations because of this, but they’re not my favorites anyway, so no problem. I did an absurd amount of research, as I always do (one of the perks of being me), on which antenna was the best value. I started by trying a variety of inexpensive rabbit-ear antennas, which was often recommended on the Internet. These worked pretty well, but I usually had to adjust the antennas as I changed stations to get a clear picture. So I decided to try a more advanced antenna. I eventually landed on a moderately priced HDTV antenna that is designed for both outdoor and indoor use and it’s just right size! The one I found is the Winegard FreeVision. It is about 20 H″ x 13 W″ and has an attractive somewhat futuristic design (see image below). I found out firsthand that Winegard also has outstanding customer support. The lowest price I could find for the Winegard FreeVision was at Amazon . 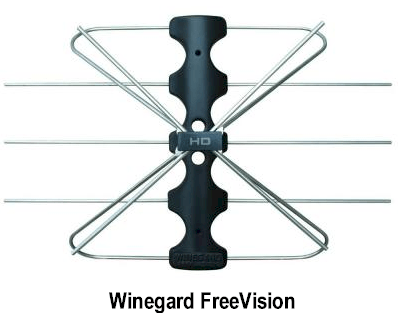 The Winegard FreeVision attaches to a mast vertically unlike a traditional rooftop antenna that is positioned horizontally. Because of its small size, unique design, and indoor/outdoor capability, your installation options are much greater. I love mine. I installed my Winegard FreeVision on my balcony by putting a wooden tree support post inside of three stacked cinder blocks filled with rocks. Then I placed two potted plants on either side. It looks good. I’ve grown accustomed to the channel lineup and don’t miss the others. If I want more free TV programs or movies, I just use Hulu.com.